We’ve talked before about the different sock lengths and how to choose the right size. One common question everyone has about socks is how to wear socks with shorts. Here are a few tips for men who are sporting socks with shorts on a hot summer day. In fact, dress shoes and shorts don’t go well together, period. If you are wearing dress shoes, you should be wearing pants along with a set of socks that are crew length or higher and match your trouser color. Nothing destroys style like low cut, baggy shorts and socks. That’s so nineties! If you want to wear socks and shorts, wear your shorts above the knee and expose your knees. Typically, its best to wear single color socks and patterned shorts, or patterned socks with single colored shorts. But don’t wear both patterned shorts and patterned socks — that can be a style killer! Ankle length socks are about as short as you can get, barely exposing the sock or the pattern. Quarter length socks are a few inches longer and allow the pattern of the sock to be more exposed. Go any longer than this, such as crew length or calf length, and you start to look goofy or like a soccer player. If you are wearing socks and shorts, wear your socks fully extended for their full length — don’t roll them down or scrunch them. This makes it look like you are wearing sweat bands around your ankles and destroys the look! 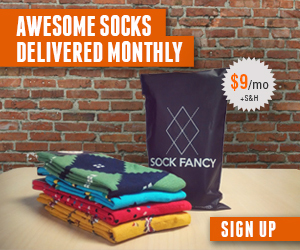 If you are looking for a classic sock subscription for men that will help you increase the style of your socks when wearing shorts, check out Sock Fancy! Next Article What color socks should I wear with jeans?